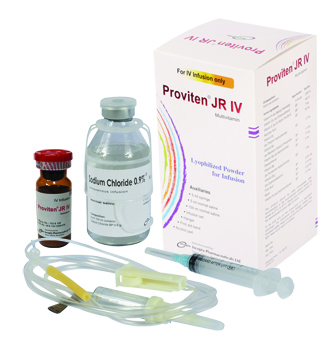 Proviten JR IV for infusion: Proviten JR IV is a lyophilized, sterile powder/cake for infusion which contains both water soluble and fat soluble vitamins. Proviten JR IV is a sterile, lyophilized powder/cake for infusion which contains nine water-soluble and four fat soluble vitamins. Mixed micelles is used as a solubilizing agent. It is presented as a lyophilized, orange-yellow, sterile powder cake that is to be reconstituted with 5 ml of Water for injections or other parenteral fluids, (e.g. as 0.9% Sodium chloride or 5% Dextrose solution), prior to administration by parenteral route. Proviten JR IV is indicated as a daily multivitamin maintenance dosage for infants and children aged up to 11 years receiving parenteral nutrition. It is also indicated in other situations where administration by the intravenous route is required. Such situations include surgery, extensive burns, fractures and other trauma, severe infectious diseases and comatose states, which may provoke a stress situation with profound alterations in the body's metabolic demands and consequent tissue depletion of nutrients. Infants weighing less than 1 kg: The daily dose is 30% (1.5 ml) of a single full dose (5 ml). Do not exceed this daily dose. Infants weighing 1 to 3 kg: The daily dose is 65% (3.25 ml) of a single full dose (5 ml). A supplemental Vitamin A may be required for low birth weight infants. Infants and children weighing 3 kg or more up to 11 years of age: The daily dose is 5 ml. JR IV should not be given as a direct, undiluted intravenous injection as it may give rise to dizziness, faintness and possible tissue irritation. For a single dose, 5 ml of reconstituted Proviten JR IV should be added directly to not less than 100 ml of intravenous dextrose, saline or similar infusion solutions. other vitamins in the B group. There have been rare reports of the following types of reactions:- rash, erythema, pruritus, headache, dizziness, agitation, anxiety, diplopia, urticaria, shortness of breath, wheezing, and angioedema. particularly at risk because their kidneys are immature.